Posted in Chicken, on August 13th, 2018. Can we ever have enough recipes for a weeknight chicken dish? Here’s another one, a new one for me, bright with leeks, lime juice and garlic. 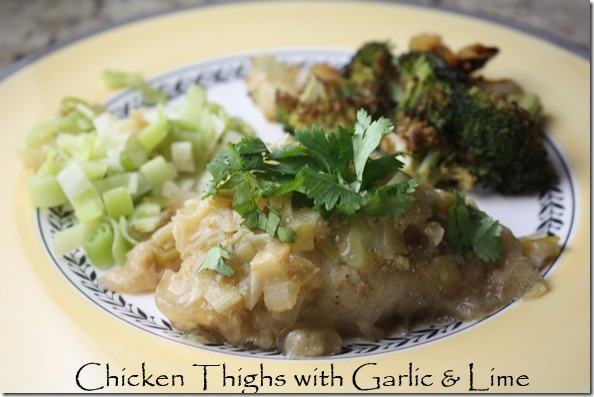 As I clicked through recipe after recipe for some new way to fix chicken, I finally came across this one – I had chicken thighs to begin with, I had fresh garlic and I had a lime. Plus a leek, which needed using. As I read this one, it said I’d entered it into my recipe program years ago (in 2001), from Cooking Light. Wow, long time ago. The original recipe didn’t have leeks in it, but I decided to use them anyway, and they provided a nice topping (and a side dish as you can see on the plate). I had 2 leeks – one would have been ample. The chicken is mixed with lime juice and garlic. I let that sit while I sweated the leek in olive oil. Then I added the chicken thighs to the pan along with more lime juice, a little tiny bit of low-sodium chicken broth and white vinegar. That was brought up to a boil and baked for about 20 minutes – or until the middle of the chicken reaches 165°F. If you use bone-in meat, it’ll take a bit longer, just so you know . . . The chicken and leeks were removed, then I boiled down the juices in the pan (on the stovetop), and that was spooned over the chicken. If you remember, serve with lime wedges and some chopped cilantro on top. Done. I’d roasted some broccoli and onions and served that alongside. One thigh was enough for me, but my son-in-law who was visiting, ate two of them. What’s GOOD: the chicken was perfectly done – still moist, yet tender. Loved the sauce on it – you’ll want to scrape your bite of chicken through whatever is lingering on your plate. Leeks were tender and delicious too. Altogether nice dish, albeit with a bit more work than some. 2. Combine first 5 ingredients in a small bowl; stir in 1 tablespoon juice. Rub garlic mixture over chicken. 3. Heat EVOO in a medium skillet and add leeks (patted dry with paper towels). Cook until leek mixture is translucent and fully cooked. Do not brown. Place chicken on top of leeks. 4. Combine 1 tablespoon juice, chicken broth, and vinegar; pour over the chicken. Place over medium-high heat; bring to a boil. Remove from heat. Wrap handle of pan with foil. Cover and bake at 350° for 20-25 minutes or until a meat thermometer registers 165°. 5. Remove chicken and leeks from pan; keep warm. Place pan over medium-high heat. Bring to a boil, and cook until reduced to 1/4 cup (about 3 minutes). Spoon over chicken. Zest half the lime and wedge the other half. Sprinkle with cilantro and lime zest, and serve with lime wedges. Per Serving: 415 Calories; 23g Fat (48.8% calories from fat); 42g Protein; 13g Carbohydrate; 1g Dietary Fiber; 170mg Cholesterol; 728mg Sodium. I can’t say I made this recipe, because I made several changes based on ingredients available and a change in cooking method, but it was great inspiration! I did not have leeks on hand, and I wanted to make more of a one-dish meal of it, but I did have chicken thighs, and I have made Nigellas chicken and pea tray back twice with delicious results, so I decided to do a mash-up of the two ideas, a tray bake instead of a skillet. With the garlic, cumin, and lime, I thought corn would be a good vegetable choice, and I found a bag of corn and a bag of limas in my freezer, so–succotash! I put the vegetables in a large roasting pan and added wedges of onion and strips of poblano. I made your garlic and lime seasoning and spread it over the thighs, placed them on top of the chicken, and poured the lime juice and broth mixture over all. Baked at 400 degrees for an hour and a quarter. Served with a cucumber salad. It was quite yummy. When I did Nigella’s recipe, which uses peas and chunks of leeks, I didn’t believe the leeks would cook through, but they did, with some caramelization. They were ambrosial. The onions didn’t caramelize–too much moisture, I guess–but all in all, it was very good. I know you would not be able to do the corn and limas, but I believe that with adjustments, one could turn this into a bake as well–perhaps with a somewhat smaller pan so the leeks could still caramelize a bit without burning. It makes its own sauce, and the thighs are amazingly crisp since they sit above the vegetables, and I didn’t need to brown them. Will try as written another time but must have leeks! And now I want leeks!